The River Damsel: HOLY C%#P, BATMAN!!! Editors Note: It has now been determined that this is a UTAH SUCKER...but, I will let this story ride... distant cousin? Why was I just a little excited about the weirdness of catching my first carp? Partly because carp are harder to catch than other freshwater species, from what I have been reading. 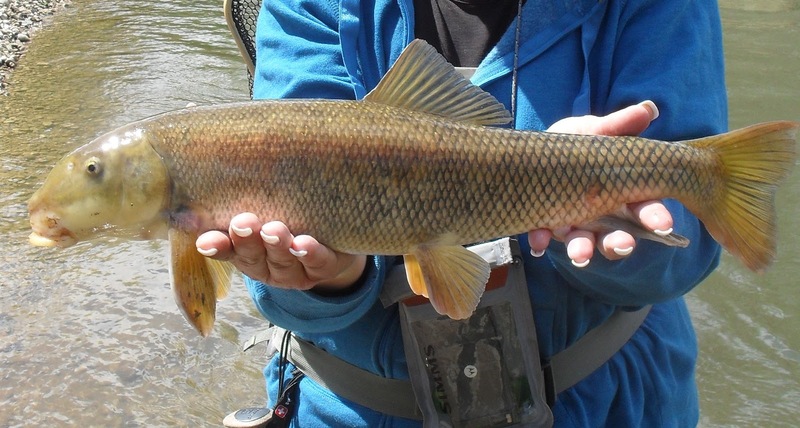 (with the exception of redhorse or gar pike) And carp are supposed to be picky, finicky, spooky and far more selective than any trout you may encounter. So, I am not ashamed...not a bit. It was cool. 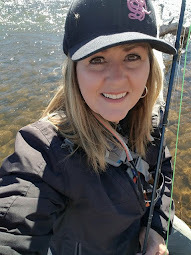 Yes, it would have been nice to see a monster rainbow or brown down there...but, I had a lesson in bringing in a tough fish and that was worth it. Nice job. Now I'm not certain if that's a carp or 'common sucker'. Cripes, I don't even know if there's much difference. None the less a heck of a catch. I was pitching flies at some carp this afternoon. It is certainly exciting to catch such a spunky fish. Great catch. Looks like perhaps a Utah Sucker (the fish, not you) although it may be a Common Sucker as RR^^ suggested above. But who am I to be the trash fish police? ;) Whatever you caught, it was not a trout and it took you for a good ride. What'd you catch it on? Ahhhh...guys! I am the "sucker" it seems...Boy, the picture looked like another carp pic that I was looking at. But, I don't have enough experience in such catches, so I will have to go along with those who are more knowledgable in the fishing world. = ) Whatever it was...It took that brown stone fly for a ride!! Brown stone nymph, yes? That essplains it. The fish mistook the fly for a turd and sucked it up. Well played tactic, Emily! Kirk - Maybe Holy Crap...was the appropriate title for this post! Be happy that you caught a fair-sized crap vacuum because that's about the best you're likely to do. You'll not soon catch a Hawg brown because you can't handle the Hawg. Listen, Mr. Hawg Brown... Do you know how difficult it is to pull a vacuum out of a river? And with a stone fly?? Don't doubt my abilities...I am getting good practice in lately! Mark my words...There will be witnesses in Sept. when the great Hawg Brown will be mine! (Until I release him...of course) Ha! Cool, fish with a vacuum cleaner mouth. David from Bay Area Backwaters fishes for them all the time. Might get some ideas over there. I have no IDEA what that thing is, but congratulations! Like I told you, when it comes to fishing, I am easily impressed. LOL! You are inspiring me! 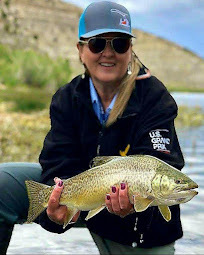 Just a few more weeks until my fly fishing lesson! And for more inspiration, I borrowed 'A River Runs Through It' from a friend, and not just because Brad Pitt is in it either...but that helps. 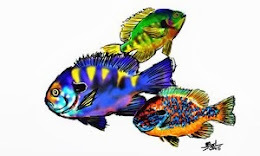 Mark ~ If you have one for your aquarium...it will stay clean! Yeah...they are ugly suckers, for sure. Kim ~ When we fish together in the future, you will no longer be impressed. Ha! Bill ~ You would be correct on all accounts! Any fish that gets you into the backing and has you smiling is alright with me...owning a couple of bulldogs, it's easy to find the beauty in "ugly". Great fish! Great story Emily! 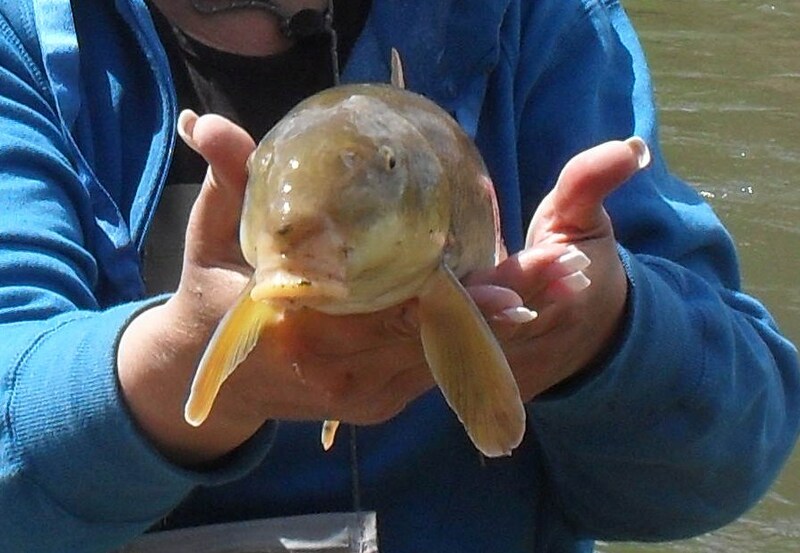 Ugly fish, but great story. I've been thinking about trying some carp on the fly fishing myself but haven't went for it. Maybe you've inspired me a bit more! That looks like our largescale suckers here in SW Idaho, we catch them often, well, when I targeted trout pre-carp days, but whatever sucker species it is one. I think it pretty, course fish do not disturb my sensibilities. Of course Chris would be able to help. Good for you! You as well have an informative and enjoyable site! 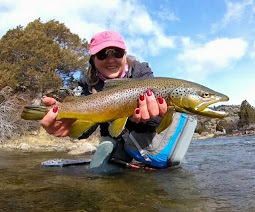 Sanders ~ Yeah...they aren't the prettiest on the block, but a lot of fun reeling in anyway! Pam ~ Well, today I actually lost a 30+in carp!! It was even more amazing than this sucker... I'm ready to go back to my friendly trout though! Gregg ~ Thanks for the comment and hope you stop by again! = ) Traveling through Idaho next week in fact, but not looking for more sucker fish! Haha. I found the blog from my buddy chris at manyafish. 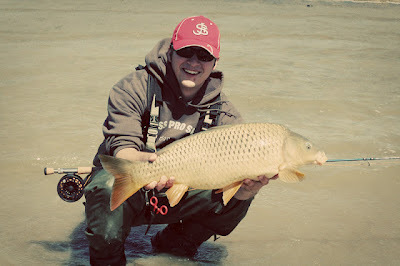 then I saw a picture of me holding a carp on your blog haha. anyways the fish in question is a utah sucker. congrats on it. ITS ALOT HARDER imo to catch than carp. when carp are tailing (feeding) they are super easy to hook up with as long as you dont spook them. nice blog by the wat. Thanks for the blog love RD. I've been away from the blogging world for a while, so I'm sorry I wasn't there to respond, but it looks like your question was answered. :) Those bottom dwellers can sure be ugly, but the chase and fight can sure be addicting! My Backyard Is "America The Beautiful"